Through the month of November, a 10% off promotion is applied to most items on the Noreast Whips site. Exceptions are: The Catalyst, Keep It Crackin’ Kit & all accessories. Since October is associated with Octoberfest, I figured we could have a ‘Noreastfest’ for November. Unless someone has a better suggestion, then I’m going with this. Some time ago, I wrote an article on Choosing The Right Whip, outling some points on making a decision on buying a whip. I wanted to throw in a few more tips here, which come to mind from many emails from prospective customers. These are things people ask frequently, so I thought to share them here. What Type Of Whip Is Best? If you ask a number of whip users what their favorite whip is, then you’ll get some different answers. Some people love bullwhips, others stockwhips and, still others, snakewhips. What type of whip is considered the best whip by people is many times constrained to what type of whip is their favorite to use. For myself, a pair of stockwhips is my favorite to use. Learning two-handed routines is a fun & challenging part of whip-cracking. But this isn’t for everyone, & I don’t believe a stockwhip is the best whip in which to learn whip-cracking. When first-time whip buyers email me, asking for suggestions on which whip to purchase, I usually steer them toward a bullwhip. This isn’t because a bullwhip is the easiest whip to crack, but it’s more middle-of-the-road in ease of learning. I think a stockwhip is probably the easiest whip to crack, but it’s a different handling whip than a bullwhip or snakewhip. Snakewhips tend to be slow & require different timing with minimal wrist action, having no solid handle to grasp. A stockwhip lends itself to more wrist action, due to the extra long handle, which can be both tricky & difficult for some. A bullwhip, I feel, is ‘just right’. It’s more in the middle of difficulty, being a bit more forgiving to learn with. So, if you’re thinking of trying your hand at whip-cracking, I suggest going with a bullwhip for your first whip. What Length Bullwhip Should I Start With? 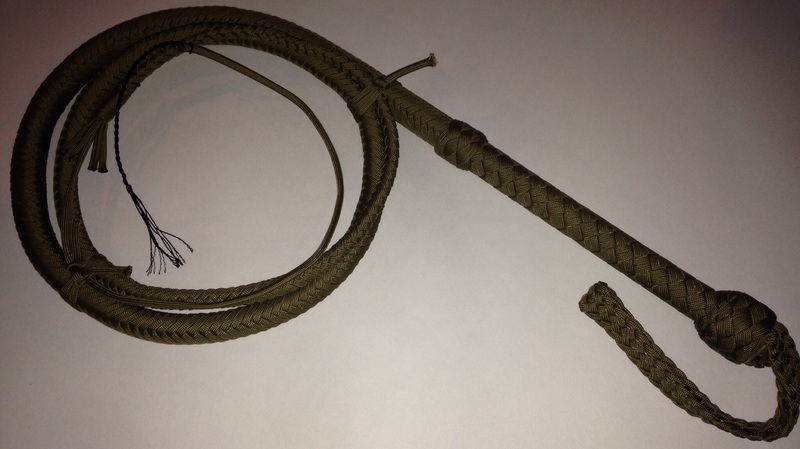 For some reason, many people inquire about having a 10-12 foot whip built for their first whip. Whether it’s the impressive sight of several coils of the whip, the thunderous wail that a long whip can make, or some other reason, I’m not sure. But to learn to crack a whip that’s 10 feet long, with an overall length of roughly 13 feet, can be tiring & discouraging. A whip that long will require a lot of room to wield & will no doubt tire you out quickly. That’s why I recommend going with 6-8 feet at most. Shorter whips are much quicker & closer to the body. They require quicker timing, making it more difficult for someone who’s never handled a whip. Being closer to the body means increasing the chance of hitting oneself with the whip, which is something you want to minimize. A 6-8 ft whip is again, ‘just right’ or in the middle. This is what I suggest. What About A Handle Strap? Unless you’re purchasing an Indy style bullwhip, I always suggest leaving off a handle strap. For one, they get in the way. Another reason is that it only serves one purpose, & that’s to hang up the whip when not in use. Many people will put the strap over their wrist when using the whip. I cannot say if this ever was an intention of a handle strap, as I honestly don’t know. Even old-time whipmakers have differing opinions on that. But I do believe it could cause injury, such as if the whip was being used on horseback & the end of the whip became entangled or stuck on something as your horse is moving. It could pull you off the whip or break your hand. So, leave off the strap, it’s not needed. Are There Any Good DVDs Or Videos To Learn From? Since purchasing these myself, I’ve always recommended that people purchase Mike Murphy’s dvds on whipcracking. Mike no longer sells his dvds on his site, nor is he currently building whips at this time, but you can still find his dvds online. Joe Strain sells both dvds that I highly recommend a new user to get: Fundamental Whipcracking Techniques and No Bull Whipcracking & Duelling Whips. Adam Winrich is a talented & skilled whip handler, who also has some teaching dvds on the market. Check out his site at http://www.winrichwhips.com/adam-store.html. He also has several free tutorials on Youtube, which may be all you really need. There are some other higher-priced dvds out there, which contain a lot of fluff & time-wasting entertainment, but I recommend going with those I’ve mentioned here. Well, that’s it for now. I hope this has been of some help to those of you looking to purchase a whip. As always, if you have any questions or would like to speak with me about whips, feel free to email me at noreastwhips@gmail.com. Thanks! This entry was posted in Whips In General/Photos. Bookmark the permalink. Get The Latest Whip News! "A Whip Is Like A Man…"